Need More Help? Schedule an Appointment! More ways to contact a librarian are included on the Ask a Librarian page. You will want to start your research on the library's homepage. Everything from books and e-books, journals, databases, and more can be accessed from the Meriam Library ReSEARCH Station. Books are a particularly good place to start your research. They have a wide scope and can include anything from background information to detailed criticism. Scholarly articles tend to be more focused and assume a higher level of expertise. When searching the library catalog keep your search terms to a minimum. 1 or 2 keywords should work fine. 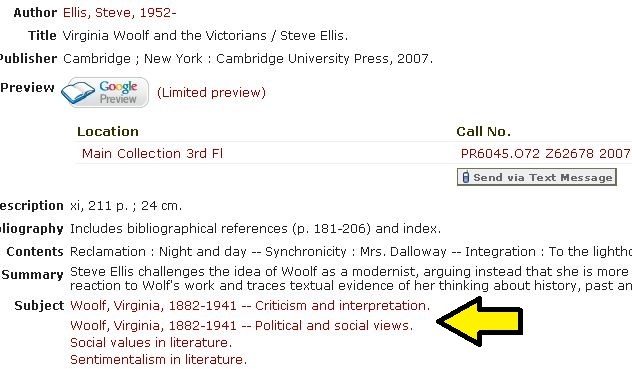 For example if you wanted to research Woolf's Mrs. Dalloway you could try searching "Mrs. Dalloway criticism" or simply "Mrs. Dalloway". For the best results try a variety of different searches. Once your search results display look at the records for more information. Often the subject headings will lead you to more materials. This worksheet will help walk your though the beginning of the research process. Feel free to use it for projects, papers, etc. Consulting a reference resource is a great way to inform yourself about a text. You can consult the following resources to gain a better understanding of an author, text, movement, etc. Comprehensive literature database. Artemis Literary Sources combines several databases into one comprehensive literature database. Contemporary Authors provides biographical and bibliographical information on more than 120,000 authors. The “largest, most extensive compilation of literary commentary available,” Literature Criticism Online, includes the resources Contemporary Literature Criticism, Drama Criticism, Literature Criticism from 1400 to 1800, Nineteenth-Century Literature Criticism, Poetry Criticism, Short Story Criticism, and Twentieth-Century Literary Criticism. Artemis Literary Sources also includes Gale Virtual Reference Library, a multidisciplinary collection of encyclopedias. Go to the Criticism and Reference link and choose the Reference tab. "Cross-search a library of print reference works alongside a range of content unique to Literature Online." Search either Gale Virtual Reference or Oxford Reference Online. Both resources have reference works devoted to 20th-century and contemporary British literature.